The Migrator Spotted Closer in the Telescope! I went to go look through the telescope and I saw that The Migrator is closer, which means Rockhopper is almost here! Does anyone else notice the mob of crabs?! 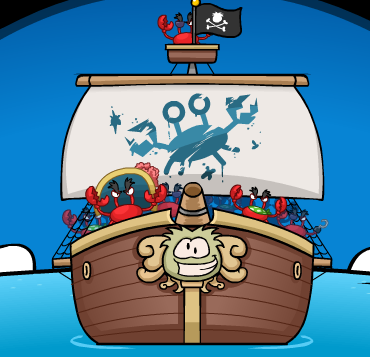 I know for a fact that I am not the only one confused about the crabs taking over the Migrator. I think those are the bad pirates we're going to have trouble with this month. Could they be related to Klutzy?